In earlier posts I have described my proposal for the solution of the measurement problem, in which a pair of quantum systems (system, observer) select a distinguished state by breaking an equivalence relationship. The physical reason of the equivalence relationship is the fundamental indeterminacy of quantum mechanics due to operator non-commutativity. The proposed mechanism preserves unitarity and does not require an interaction Hamiltonian.Of course, an interaction Hamiltonian can break the the equivalence relationship as well, but today I want to focus on how interaction free measurements can occur in nature. There are several proposals on interaction-free measurements but the most dramatic and well known one is due to Avshalom Elitzur and Lev Vaidman, in the form of Elitzur-Vaidman bomb tester. On a personal note, Avshalom is very pleasant down to earth non-conformist person who speaks truth to power, is a genuine truth seeker, and a champion for the lowly persons toiling to push the boundary of knowledge. Last year I was having lunch with him at a conference when he surprised me by offering to swap our speaking time slots. This was like offering to swap a shiny new Mercedes Benz with a beat down Toyota. I was too stunt to accept it, but I was deeply touched and I owe him a debt of gratitude for the random act of kindness. Now back on the bomb tester, the setup is as follows: a bomb factory produces extremely sensitive bombs which explode when they interact with a single photon. However the factory is not perfect, and sometimes they manufacture duds and the quality assurance department of the factory has to eliminate those defective bombs. The question is: how to do it? In a classical physics universe, this would be an impossible task: the very act of testing the bomb would explode the good ones, and leave the bad ones intact. Now here comes quantum mechanics to the rescue. Suppose we have an interferometer like the one in the picture below, tuned in such a way that every incoming photon triggers a detection at D1 while D2 does not detect anything. I am too lazy to write the required LaTeX formulas and I picked a picture which shows the actual quantum states along the arms of the interferometer. Now if a functional bomb is inserted on the top arm, it blocks the top photon path. If the photon takes the upper path, it will explode the bomb. If however it will take the lower path, the interference at the second beam splitter is prevented and the photon would be detected at either D1 or D2! Detection at D2 would signal a working bomb was inserted and moreover we found out the information without exploding it! But wait a minute? What would happen if a dud is inserted into the interferometer arm? The dud does not interact with the photon, and the detection would always occur at D1. Now the next question for the quality assurance department is to figure out if there is a way to increase the detection rate of the good bombs without exploding them. This is again possible using quantum mechanics and the idea comes from the quantum Zeno effect or in more popular terms: a watched pot never boils. In the quantum world, this is an actual real effect, and not a psychological phenomena. In fact, using the quantum Zeno effect the efficiency of the bomb detector can be increased arbitrarily close to 100%. Now if you think this is all nonsense theoretical musings, nature confirmed the reality of the argument. For details see this experimental paper. So what do we learn from the existence of interaction-free measurements? First, nature is quantum mechanical. There is simply no way classical physics can achieve interaction free measurements. Second, quantum measurements is not a naive process which can be explained away by finding some interaction Hamiltonian. True, there is an interaction taking place here, but this is between the photon and the detector, not between the photon and the bomb. Third, the role of the observer is essential: no observer means no collapse. So how does my proposed solution to the measurement problem using the Gothendieck group construction fare against interaction free measurement? It passes with flying colors. Gothendieck group construction demands the construction of a Cartesian pair, and physically the pair can be identified with the quantum system and the observer. Also the collapse is a change in representation, not a unitary evolution. Last, the unitary evolution is completely preserved. The only strange part is the existence of many Hilbert spaces each corresponding to a potential outcome. Still, this proposal is not the many worlds interpretation. Since the Hilbert spaces are only mathematical constructs devoid of physical reality ("Quantum phenomena do not occur in a Hilbert space. They occur in a laboratory"-Asher Peres), we can embed all those Hilbert spaces into a single one and the quantum interpretation which arises out of the Gothendieck group construction is that of Copenhagen. This experiment is not "interaction-free". The interferometer and the bomb are made out of atoms consisting of charged massive particles. Therefore there exist an electromagnetic and gravitational interaction between them. You have chosen to redefine the word "interaction" to mean "hitting with a particle". By this definition determining the properties of a black hole by observing its effect on other objects would also be "interaction-free", which is ridiculous. The bomb detector uses a similar approach. It does not detect the bomb by hitting it with a particle but by observing its effect on other objects. "There is simply no way classical physics can achieve interaction free measurements." I have just offered you an example. A classical, intuitive picture for the bomb tester can be provided by the Couder's oil-drop model. Placing a true bomb changes the pattern of the waves determining a change in the particle's path. "Third, the role of the observer is essential: no observer means no collapse." The only thing the observer does is acknowledging the experimental result but the result does not depend on the observer in any significant way. I see that you share this "observer" obsession with Lubos. Where did you get it? The collapse postulate says nothing about observers. "Gothendieck group construction demands the construction of a Cartesian pair, and physically the pair can be identified with the quantum system and the observer. Also the collapse is a change in representation, not a unitary evolution. Last, the unitary evolution is completely preserved. The only strange part is the existence of many Hilbert spaces each corresponding to a potential outcome." Can you please translate that in English? What do you think happens in this experiment? What changes and in what way when a good bomb is replaced with a bad one? First, Andrei, you have used the o-b-s-word about 9 times, while Florin 4 times (make a search), and I won't use it at all, so your claims about "obsession" are obviously false. Second, in quantum field theory, the most accurate description of non-gravitational physics, interactions *are* exactly equivalent to particles' hitting of each other. The electromagnetic forces are due to the exchange of virtual photons, too. Even if you tried to construct some alternative theory where interactions are not about the exchange of particles, your attempt to avoid the conclusion of the experiment wouldn't work. The reason is that even with your vague "effect of the bomb on other objects", there's still the third Newton's law that guarantees that this action of the bomb on something else induces a reaction - some effect on the bomb itself. In principle, there must be a way for the bomb to feel it. But the experimentally demonstrable - and in QM, easily mathematically provable - conclusion of the experiment is that the bomb won't detonate in the case when the trajectories may be retroactively interpreted to avoid the bomb, regardless of the fineness of the internal detection mechanisms inside the bomb. So once one fails to make a detection apparatus within the bomb that would allow it to explode in these cases, he has extremely strong evidence that the hypothetical effect you are describing simply couldn't exist. In quantum mechanics, it really strictly and exactly doesn't exist. "Some people often have the desire to "restore some realism". So they say that the collapse of the wave function isn't tightly linked to some observer or his act of an observation. Instead, it's a result of an interaction." It doesn't matter how often you use the word, you clearly consider the role of the observer essential. You have also tried to use the observer's subjectivity as a way out of my argument against the compatibility of non-realism with locality. It didn't work there because the argument works just fine with a single observer, but still, the observer seems to be fundamental in your view of QM. "Second, in quantum field theory, the most accurate description of non-gravitational physics, interactions *are* exactly equivalent to particles' hitting of each other. The electromagnetic forces are due to the exchange of virtual photons, too." The fact that you describe the electromagnetic interaction as a classical continuous field or as a stream of virtual particles does not change the fact that such an interaction always exist between charged particles. "Even if you tried to construct some alternative theory where interactions are not about the exchange of particles, your attempt to avoid the conclusion of the experiment wouldn't work. The reason is that even with your vague "effect of the bomb on other objects", there's still the third Newton's law that guarantees that this action of the bomb on something else induces a reaction - some effect on the bomb itself. In principle, there must be a way for the bomb to feel it." Of course the bomb "feels" the electromagnetic interaction between its particles and other particles outside. However, the bomb cannot be made to explode under such circumstances because it would detonate under the influence of the virtual photons produced by its own atoms. The bomb only detonates if a real photon hits it. 1. A bomb that explodes under the influence of an electric or magnetic field cannot be built because the fields produced by its internal electrons and nuclei would blow it up. 2. 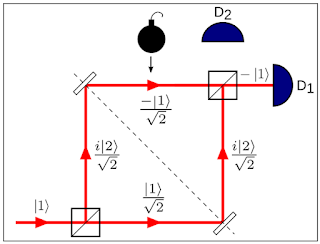 A bomb that explodes when a photon hits it would still be able to change the path of the distant photon because of the EM interaction between its internal particles and the particles from the interferometer. 3. The effect is not "hypothetical". It is absolutely true that charged particles do interact with each other in both classical and quantum electromagnetism. 4. The mathematical description of the EM interaction (continuous fields or virtual particles) does not change the fact that such an interaction exists. "It doesn't matter how often you use the word, you clearly consider the role of the o-b-word essential." I do so because the scientific evidence unequivocally shows that this is how Nature works and this very experiment is another powerful example making this conclusion very clear. This experiment has nothing whatever to do with (long-range) electric or magnetic field. You're just spamming this thread with garbage that has nothing to do with any promising explanation of what's going on. You are never actually explaining any experiments - you have never even tried to do so, let alone succeeded - and you apparently think that it doesn't matter and you may still pretend that you are a physicists' peer in these discussions. But you're just an obnoxious crackpot. As expected, Lubos, as long as your opponent doesn't accept your unsupported beliefs as fundamental principles of physics you start using your best arguments, insults. You are behaving just like a spoiled child so I'll just ignore them. "I do so because the scientific evidence unequivocally shows that this is how Nature works and this very experiment is another powerful example making this conclusion very clear." The only thing that this experiment proves is that a change in the geometry of the slits produces a change in the pattern of the screen. The number of holes, the distance between them and the presence of other obstacles, such as the bomb is the only thing that matters in the quantum mechanical calculations. The observer and its beliefs is just irrelevant for this experiment and your insistence that it is makes you look silly. "This experiment has nothing whatever to do with (long-range) electric or magnetic field." The physical effect of placing a barrier in the particle's path is to change its momentum. That means the particle interacts with the barrier. Modifying the barrier by adding more slits or by blocking them results in a change in the pattern on the screen which indicates a change in the interaction responsible with the momentum transfer. The only interaction that can be responsible for this is the electromagnetic one. So, it necessarily follows that the EM interaction (which you don't seem to deny anymore) between the bomb and the barrier is the cause of the change in the pattern on the screen. "You are never actually explaining any experiments - you have never even tried to do so, let alone succeeded"
fluctuations," Ann. Phys. 327 (2012) 421-437. You are the one that instead of a physical explanation in terms of interactions between particles (which is also implied by the quantum mechanical calculation) come up with stories about how observers knowledge determines the experimental outcomes. I would be very curious about how the observer's knowledge can account for momentum conservation. As I said before, I am not shy to call Lubos out when he is wrong. Also I give credit where credit is due (even when the post is anonymous and originates from the Czech republic-wink wink). In this case, Lubos hit the nail on the head with Newton's third law. Action and reaction. Classically you cannot avoid exploding the good bombs. On your question: "What changes and in what way when a good bomb is replaced with a bad one? ", the answer is: for the bomb absolutely nothing. The bomb gets hit by a photon or it does not get hit. When the good bomb gets hit, it explodes: the original scheme is not 100% fool proof and some good bombs would be wasted. The change is at the detector. When the detection happens in a certain way you know you have a good unexploded bomb. "In this case, Lubos hit the nail on the head with Newton's third law. Action and reaction. Classically you cannot avoid exploding the good bombs." Did you read my answer to Lubos? Virtual photons that are responsible for the electric and magnetic forces are already inside the bomb. A copper wire for example maintains its shape and size due to these forces so there are countless of virtual photons in it. A bomb that explodes because of virtual photons is as impossible to build as a warp drive. Therefore it is possible to determine the type of the bomb by probing the electric and magnetic field around it without blowing it up. "A bomb that explodes because of virtual photons is as impossible to build as a warp drive. Therefore it is possible to determine the type of the bomb by probing the electric and magnetic field around it without blowing it up." Here is how one can set a realistic scenario. Let's pick a particular wavelength, say for a particular red color (the choice is irrelevant). Also let's say we have a "one photon detector" for this red color able to detect the presence of a photon. Then we hook up this detector as a trigger to a bomb. We work in an old fashion photographic lab which is illuminated only by this red color and we cannot test the detector before being attached to the bomb. Moreover, we cannot separate the detector from the bomb (maybe it is glued too tight and the bomb is too sensitive to the vibrations required to decouple it from the trigger and this will set off the bomb). So can you tell apart the good bombs from the bad ones using classical physics only? (by probing the electric and magnetic field around it)-remember there is only the particular red wavelength light available. "G. Grossing, S. Fussy, J. Mesa Pascasio, and H. Schwabl, "An explanation of interference effects in the double slit experiment: Classical trajectories plus ballistic diffusion caused by zero-point fluctuations," Ann. Phys. 327 (2012) 421-437. I do not deny the possibility of the experiment, I only deny the implications you think it has. The bomb tester experiment works via a classical mechanism where the electric and magnetic fields around the bomb are probed by their effect on the interferometer. There are no "genuinely" quantum effects. Everything is classical. I cannot provide a definite proof for that but what I can do is show that all arguments against the possibility of a classical mechanism fail. Have you explained in simple words(!!!) "Gothendieck group construction" in some previous blog which I missed.Is the difference between this and the usual quantum theory that usually one has only one Hilbert space and in "Gothendieck group construction" you have many Hilbert spaces? What is the advantage of introducing multiple Hilbert spaces if you get the same results as the usual quantum theory? Long story short: Grothendieck group formalism is a completely equivalent mathematical description of the Copenhagen unitarity and collapse story. However in this formalism there is no collapse and and no unitarity violation. This is similar but distinct from MWI. In MWI there is one Hilbert space and many worlds, in this case there is one world and many Hilbert spaces. I had several posts about it, but the gist is this: the physics is represented by operator algebras and their state correspond to a state in a Hilbert space by GNS construction. Now distinct outcomes correspond to different states (the collapsed ones) and one cannot tell them apart *before* measurement. The fact that you cannot tell them apart corresponds mathematically to an equivalence relationship in a mathematically precise way. The measurement process corresponds to breaking this equivalence relationship. You start with a single Hilbert space in the usual way. But when an observer enters the picture there is an ambiguity about the measurement outcome and the pair (system, observer) can have several physical indistinguishable representations in different Hilbert spaces. The distinct Hilbert spaces are only a convenient pedantic book-keeping device. Just as good is to work with a single Hilbert space and talk about collapse the usual way. Here is an analogy from natural numbers and integers. QM: Cartesian pairs of (system, observer) linked by an equivalence relationship, and only unitary evolution. Mathematically the usual and the pedantic way are completely equivalent, but the pedantic way avoids talking about (subtraction or) collapse and the price to pay is the Cartesian pairs linked by an equivalence relationship. One can see that the detector D_2 does not receive a photon from classical arguments. A photon that travels the top arm and reaches D_2 is reflected 3 times, with that many pi/2 phase changes. The photon that travels along the bottom path and reaches D_2 is reflectedonce and so has two pi/2 phase change difference cancels out the electric field to the D_2 detector. Consequenty photons travelling the two routes with the same polarization will destructively interfere. So for a coherent source of photons with the same polarization D_2 should never receive a photon. The in the quantum argument the photon is a superposed state passing through the two paths and the paths must combine to reach D_1. If there is an obstruction in the top path then photons can reach D_2.